Nizozemské lavírované olejomalby, jež jsou namalovány akvarelově tence, jsou až dodnes nedostižným vzorem stálosti olejové techniky ! Dutch layered oil paintings are still an unrivaled pattern of oil technology stability! Why is the lead (cremnitz) white best on layered technology? The answer to this question can be found in the book by Bohuslav Slansky, Technique in Painting. Unfortunately, right at the beginning of the article, I must start with not much good news: Thanks to the EU the production and distribution of lead and white pigments is currently prohibited. The market is available only as a preparation for restorers with special permission from the Ministry of Environment. However, it is still possible to get this color in some foreign trade. E.g. 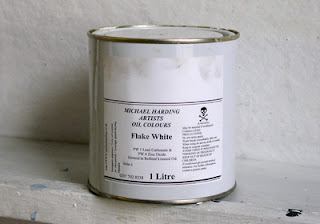 At RGH Artists Oil Paints, Rublev colors etc, Michael Hardings oil colors etc. Lead white (Flake white or Cremnitz white). This white is composed of alkaline lead carbonate (2 PbCO3, Pb (OH) 2). Its quality depends on the ratio of both components. Lead carbonate itself has too coarse grain, low shear, and does not support oil drying. White has the more favorable properties so the Pb (OH) 2 content is larger. The optimum ratio is 35% Pb (OH) 2. It comes to the store as a white powder, though gentle but somewhat grainy. A kind suitable for artistic creation is referred to as "cremnitz white". Leaded white has been obtained from ancient times by the action of acetic acid vapors on lead, and therefore contains a small amount of lead sugar (basic lead acetate), which is revealed by a sour smell. If its interference exceeds 1%, it is harmful (such whiteness with oil is more yellow), but it can be washed with water from the powder pigment.The most prominent properties of lead white can be denoted by large dyeing and masking capacity as well as reactivity with oil. With oil, which consumes between 7 and 13%, the air will solidify soon, not only on the surface, but on the entire layer; It is therefore indispensable for the preparation of oil based coatings and for oil painting in layers, especially in sublayers, which is well absorbed by other colored layers and lacquers (which are easy to bond and do not break). It is also a suitable pigment for the preparation of oil bases. The oil acts as a weak base; Drying out a small amount of lead soap, which further accelerates the drying process. This ability also transfers white to the other colors with which it is mixed. In pure air, oil lead white is resistant to weathering and humidity, its layers remain elastic for a long time and well bonded to the substrate.It also has some shortcomings. It is violently poisonous: if we tread it, we must make sure that its powder does not explode. 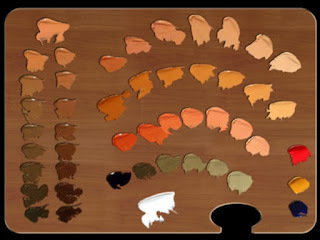 Cases of severe poisoning with this pigment are known. In the dark, yellowing causes oil, but it disappears again in the light. A freshly painted painting that has been yellowed because it has been turned to a wall for a long time, the original color returns after several days in strong daylight and after hours in direct sunlight. By the action of hydrogen sulfide, lead white first turns brown and then completely black; This change will occur only if it has not been sufficiently bonded, ie in watercolor, pastel and gouache. Its darkening can be removed with hydrogen peroxide, which turns black lead sulfide into white sulfate. However, blackening does not occur in oil paintings and strongly bonded temperaments.Theoretically, substances containing sulfur (cadmium, ultramarine, rum, lithopone) can cause lead white bleaching. Surprisingly, long-term practice and our knowledge of this pigment in medieval to baroque paintings do not confirm this premise. If we go through the gallery, we find that the bright portions of the paintings - which until the middle of the 19th century are without exception painted with lead white - have been preserved in good condition, often even in the best of the whole picture. Lead white lead pastes resisted total darkness even on dark background images, while other colors of less cover ability on such substrates often darkened. In addition, the pasty reliefs of this white paint on the paintings of the old masters are less cracked than do other colors and do not tend to crack. Lead White has a prominent place in the history of painting from antiquity to the 19th century. To do this, it has to be remembered that it was very well preserved in Italian paintings of the 14th and early 15th centuries, painted by tempera, although the base of the Italian tempera was then an egg yolk containing sulfur. Lead White is a material that is extremely pliable and ductile: either as a subtle continuous coating, creating a super-fine plastic relief on Gothic and Early Renaissance paintings, or as a paste processed in a compact layer with a polished ivory surface on Renaissance paintings, or finally as a pastel coating on paintings Baroque and Rococo, revived by a distinctive manuscript. In pictures of various styles we encounter it in a variety of forms of technical use.The production of lead white by the action of acetic vapors on lead plates was described in the 4th century BC by Theofrastos, in the 1st century AD by Plinius and Vitruvius. Since the Middle Ages, its production has been mentioned in a larger number of technical writings. All these records indicate that the production process of the past times did not differ from the modern methods of the Dutch and the Kremlin. Only in recent decades there has been a substantial change. The new production process yields a very pure pigment with a very fine grain, a good color of yield and a cover strength.Today lead-white has lost importance. It is often replaced with titanium or zinc white, while lithopone and pastels are also prepared. There are still some painting purists who question whether or not these pigments are true oils, but I assure you they are. In fact, I have been successfully executing my paintings using water soluble oils with professional results for over 10 years. Norman Brodeur & Norman J Brodeur made the smooth transition from acrylics to the new oils in my home studio so my family and pets were not exposed to toxic fumes. With an open mind and a little time experimenting, you might also enjoy the benefits of water soluble oils.